Small of of stature and feisty, Steinberg does not come across as a starry-eyed tree-hugger; instead, he has the focused, slightly impatient air of someone from the East Coast, which in fact is where he's from. When asked, he said he moved to this broad river valley in 1980. "It was gorgeous back then," he said somewhat wistfully. Even to the uneducated eye, the "viewshed" in Van Duzen country looks a tad ragged these days. Logged patches intermingle at odd angles with forest stands, giving the landscape an uneven, helter-skelter look. The image of a beard marred by bald spots floats absurdly into the mind. To hear Steinberg tell it, there's more ailing his adopted home than a spoiled view. In his mind -- and the perception is backed up by solid scientific studies --the entire ecosystem is unraveling: Salmon and steelhead populations are in serious decline; birds like the northern spotted owl and the marbled murrelet have become so rare that sightings are greeted as sacred gifts; shade-and moisture-loving reptiles and amphibians appear to have dried up and blown away. In the case of the birds, the problem is a steadily diminishing supply of big trees. Murrelets, which spend part of their lives at sea, lay their eggs in the branches of old-growth redwood trees, while spotted owls, reclusive by nature, do best in deep, dark forests. For the fish, the enemy is sediment run-off from clearcuts and logging roads -- salmon eggs are buried alive by such erosion, while juvenile salmon, steelhead and cutthroat trout have trouble feeding because they can't see well in the murk. Factor in the filling up of deep, cold water pools with sediment and the elevation of the river bed itself, and you have a flattened out, shallow waterway that in the heat of summer is a death trap. The decline of wildlife in the Van Duzen due to poor water conditions is central to a long-simmering dispute between the staff of the North Coast Regional Water Quality Control Board and the California Department of Forestry over the pace of logging on Pacific Lumber Co. lands in the Van Duzen -- a pace that has accelerated as the company's operations have been restricted in other watersheds, notably Freshwater and Elk east of Eureka, due to concerns about flooding. Over the past year or so, the water board staff has formally opposed six timber harvest plans in the basin on the grounds that the forestry department is allowing levels of logging -- particularly clearcuts -- that exceed restrictions contained in the "sustained yield plan," a document governing logging on the company's holdings that was part of the 1999 Headwaters deal. Continued opposition from water board staff is expected, but the overriding reality is that the forestry department -- which has the reputation of favoring the timber industry -- is in charge of regulating private lands logging in California, not the state water board. Steinberg knows that all too well. And he's aware that if there is to be a timber industry in Humboldt County -- and the Van Duzen is arguably the heart of it -- negative effects to wildlife and the environment must be tolerated, at least to an extent. "We're not against logging," he said, referring to the citizens' group, Friends of the Van Duzen, that he heads. "We just want everything to be healthier." Having a healthy timber industry and a healthy environment in a watershed like the Van Duzen has never been easy, and may be impossible. According to a 1999 study by the U.S. Environmental Protection Agency, the Van Duzen River basin, which drains 429 square miles southeast of Eureka, is peculiarly susceptible to damage. "A highly active tectonic setting, combined with sensitive terrain and high rainfall amounts, make the [area] one of the most erodible watersheds in the United States." By using the term "sensitive terrain" to describe the watershed's geology, the report's authors were indulging in a euphemism. Tom Stevens, a geologist with SHN consulting in Eureka, was less polite. "There are three main formations, and one of them, the [Franciscan] melange, is really nasty. It's a disassociated matrix of Jurassic and Cretaceous age" (think dinosaurs). It's "a real mix of stuff" that is unstable precisely because it is a jumble, Stevens added. Stevens, whose clients include the Pacific Lumber Co., has spent more than 20 years studying the geology of the Van Duzen. He said there is a slide outside Bridgeville that is truly of titanic proportions, reaching from the river all the way to the ridgetop. It's been bleeding sediment into the Van Duzen River for thousands of years, "probably since around the Pleistocene." Absent logging or any other human impact, "there is normally a fair amount of sediment in that river," Stevens said. But a 1980 study by Harvey M. Kelsey, a scientist with Redwood National Park, found that the human impact over the last 130-odd years should not be discounted. One damaging factor cited by Kelsey was livestock grazing in upland grassy areas that began in the 1870s and, in a surprisingly short period of time, produced an ecosystem conversion: native prairie bunchgrasses were replaced by weaker, short-rooted annual grasses much less able to hold the ground in place. The result was "shallow, extensive gully networks and small slump failures" that plague the area to this day. Logging also took its toll, according to Kelsey -- aided and abetted by the legendary storm that hit the entire North Coast in December 1964 and generated enormous floods lasting three days. Interestingly, an almost equally large storm that slammed the area nine years before, in December 1955, unleashed nowhere near the amount of sediment into the Van Duzen River as the 1964 storm. In part, Kelsey said, this was because the earlier storm primed the pump, so to speak, by initiating cracks in steep areas that completely gave way in 1964. But the post-World War II logging boom also played a major role. When the 1955 storm arrived, the clearcuts were not yet 10 to 15 years old -- the time it takes for tree roots to rot. By 1964, such decay was widespread, so when the storm came there was nothing to keep hillslopes in place. Kelsey estimated that debris sliding and avalanching during the 1964 flood released almost 11 million tons of material into river channels in the Van Duzen watershed, raising streambeds 10 feet and more. The event, Kelsey calculated, caused 49 percent more sediment to enter the Van Duzen basin over the 34-year period from 1941 to 1975 than would have been the case without the storm. Kelsey's paper, still considered definitive 23 years later, ended with a bang. Based on a "landform reconstruction of the basin," the circa-1980 sediment yield from the basin -- 2,600 tons per square kilometer per year -- was "three to six times the maximum possible long-term rate since the late Miocene" more than five million years ago. He made it clear that people had played a key role in the unusually high amount of present erosion. "The current rate," he said, "which is probably one of the highest ever, may in part reflect recent uplift, but land use of the past century has been a major contributing factor." The geologic picture was further sharpened in 1999 when the Arcata-based Pacific Watershed Associates released a 44-page report entitled "Sediment Source Investigation for the Van Duzen River Watershed." Based on field surveys and analysis of aerial photographs, the study estimated that a whopping 31 million cubic yards of sediment had sloughed off the basin over the 44 years from 1955 to 1999. 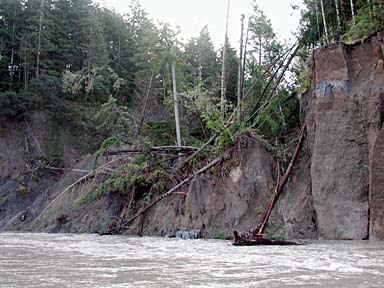 Almost 80 percent of the erosion occurred prior to 1980, reflecting the magnitude of the storm events of 1955 and 1964 and "less protective land use practices" (i.e. more intensive logging and grazing). Nonetheless, the report determined that logging in particular continues to be a major contributor of sediment; in the lower portion of the basin, 36 percent of the sediment discharged to tributaries of the Van Duzen River comes from logged areas, logging roads and skid trails, according to the report. "What that means," Steinberg said, "is that one out of every three soil particles floating down the river is due to logging. We can do something about that." 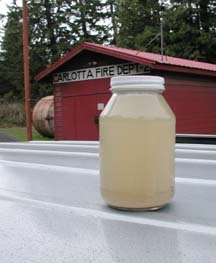 A jar containing a murky water sample taken from a Van Duzen River tributary. Do what is the question. One strategy that seems to be fizzling has to do with setting a basin-wide ceiling -- known as the "total maximum daily load," or TMDL -- on the amount of human-caused sediment run-off. The TMDL effort dates back to 1992, when the U.S. Environmental Protection Agency listed the Van Duzen as "sediment impaired" under the Clean Water Act. The North Coast Regional Water Quality Control Board followed suit four years later, declaring the Van Duzen River an "impaired waterbody" in which "beneficial uses," such as habitat for salmon, had been "adversely impacted by high sediment loading." The Pacific Watersheds report, done under contract to the federal government, laid the groundwork for determining the TMDL for the basin by identifying the amount of sediment delivered to stream channels by various erosional processes. But the next step -- imposing restrictions to reduce sediment -- has yet to occur. Given the Bush administration's opposition to the whole TMDL process, Steinberg doubts that anything will happen soon on this front. Meantime, logging is continuing apace. The signs are everywhere -- a field of stumps poorly hidden by a thin screen of trees just north of Highway 36 near Van Duzen County Park; a fresh clearcut above the confluence of Hely Creek and the Van Duzen River; helicopter pads tucked into the woods. One such pad is practically in Steinberg's back yard. Located 1,200 feet from his house, PL workers used it for five days last fall to pull timber from the other side of the Van Duzen River. The plan to clear trees for the pad was in the paperwork for the South Rune timber sale, but Steinberg said it was inserted so unobtrusively that Friends of the Van Duzen didn't notice it until it was too late. Particularly egregious, according to Steinberg, was the assertion that the pad was five miles from Carlotta when in fact it was practically in the middle of a neighborhood. "They used the post office as the location for Carlotta," Steinberg said. The problem with that, he explained, is that the residences that make up the town are strung up and down the Van Duzen for several miles. Adding insult to injury was the fact that the heli-pad was located in the general area of a "community park" that residents a couple of years ago had asked the company to not log in. After Friends of the Van Duzen made a stink, Pacific Lumber stopped using the heli-pad and sent out a notice of apology. That did little to soothe Steinberg's wife, Naomi Steinberg [in photo at left] , a rabbi who works out of her home. The din from the choppers, which flew steadily from 7 a.m. to 5 p.m. five days a week, was so deafening that at times she couldn't use the telephone. "To me, it's preposterous that this kind of activity can be allowed with no public oversight. In effect they moved an airport in next door." Humboldt County Supervisor Roger Rodoni was contacted, but the Steinbergs were told there was no noise ordinance on the books that pertained to helicopter logging. 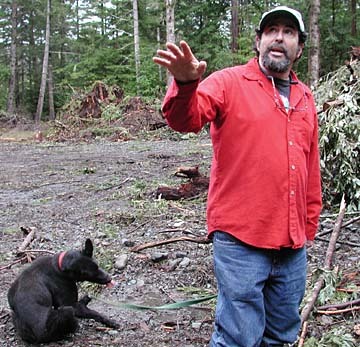 According to John Marshall, deputy chief of resources management for CDF, state forest practice rules don't address the impacts to nearby residents of helicopter logging. "So you fall back on [the California Environmental Quality Act] in terms of deciding whether there's a significant adverse effect. It's a judgment call" -- one made more difficult, he added, by the fact that helicopter logging is beneficial in that it greatly reduces the soil disturbance caused by logging operations. As for the heli-pad used in the South Rune operation, Marshall said, "I'll admit it was very close to residences in there. It was very loud and there was an echo effect" because of the river canyon. 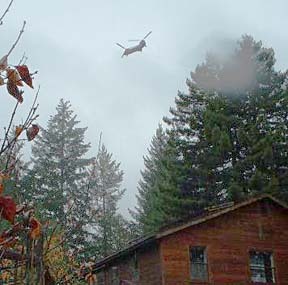 Complaints about helicopter logging -- which can rattle windows and dishes along with nerves -- are common up and down the Van Duzen river corridor. Patrick Boyle of Van Duzen County Park said visitors this past summer complained vehemently about the choppers, which gave them a rude awakening early in the morning as they slept in their tents. Some people left because of the noise, Boyle said. Ironically, restrictions in the company's "habitat conservation plan," another guiding document of the Headwaters deal aimed at protecting endangered wildlife such as the murrelet, has forced PL to rely more on choppers to haul logs. Logging near murrelet habitat is restricted during the bird's nesting season, which runs from March 1 to the beginning of August. "That pushes the company into logging in the late fall and winter," when there is a dramatically increased risk of erosion due to rainy weather, said Bill Snyder, deputy chief of forest practice for CDF. "So they end up doing things like helicopter yarding which they probably wouldn't do otherwise." Helicopter logging is extremely expensive, Snyder explained. Snyder, as the CDF official in charge of reviewing and approving Pacific Lumber's timber harvest plans in the Van Duzen, is the man to whom the staff of the water board have been submitting their logging challenges. About half-a-dozen letters, dating to Dec. 11, 2001, all pretty much say the same thing: The company is logging in the Van Duzen faster than is allowed under the sustained yield plan; consequently, as required by state forest practice rules, logging must halt until CDF amends the plan. By how much are allowable logging rates being exceeded? According to a "Pre-Harvest Inspection Report" filed on Jan. 6 by David Kuszmar, an engineer on the water board staff, by a lot. For example: under the sustained yield plan, the amount of land in the Van Duzen basin slated for clearcutting from 1999 to 2009 is 1,638 acres; already, just four years after the plan took effect, the company has proposed or received approval to clearcut 2,535 acres -- almost 900 acres, or 55 percent, more than is called for in the plan. Snyder does not dispute that logging in the Van Duzen is happening faster than was anticipated. But he said the water board staff is misinterpreting the plan. The harvest volume doesn't apply to specific watersheds, he said, but to Pacific Lumber's entire ownership, which totals 211,000 acres. When looked at that way, Snyder said, it becomes clear that no violation of the sustained yield plan is taking place. The reason the Van Duzen is seeing so much logging right now, Snyder said, is because Pacific Lumber operations are restricted in other watersheds -- particularly Elk and Freshwater, where residents have longstanding complaints about flooding and ruined drinking water supplies that they attribute to the company's logging. "For more than two years we were not approving THPs for Freshwater and Elk. That impacted the company and they didn't have much of an operational cushion in terms of approved plans. So they have been focusing more on the lower Eel and the Van Duzen. They want a cushion. They don't want to live month to month on THPs." 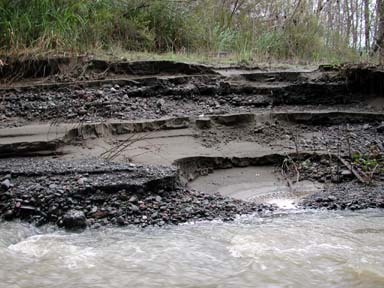 Sediment deposition along Hely Creek downstream of a clearcut. There's no question that one of the goals of the sustained yield plan is to provide the company with a steady supply of trees to cut. But the harvest projections under the plan are also designed to protect wildlife and water quality. And the water board staff insists that the levels of cutting being permitted in the Van Duzen are jeopardizing those resources. "We cannot be reasonably assured that proposed harvest activities will not result in significant adverse impacts to [water quality, fisheries and aquatic life]," said Kuszmar in his report. What happens next in this impasse is unclear. One possibility is to ask the state water board to appeal the logging to the state board of forestry under a procedure known as a "head of agency appeal." But requests for such an appeal have never been granted in the past, and the chances this time around don't look good given current political realities. Another tack would be to seek a meeting of the "liason committee," a panel comprised of the heads of all the agencies involved in the Headwaters deal. Such a review would be unprecedented, and could conceivably lead to a reconsideration of logging across PL's ownership. As of press time, indications were that the water board staff was on the verge of requesting such a review. For Steinberg and other members of Friends of the Van Duzen, it is satisfying that -- at last -- logging in the basin is getting challenged. It wasn't long ago, 1998 to be precise, that a letter sent to CDF by Ken Anderson, a resource ecologist with Grizzly Creek State Park, was a lonely cry of protest. 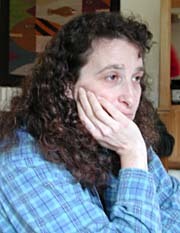 Anderson asserted that accelerated timber harvesting that began in the 1980s had seriously damaged the park's resources. "Our most popular swimming hole, just below the confluence of Grizzly Creek and the Van Duzen River, existed for decades prior to this timber harvesting. Now it is gone, filled in with sediment from logged slopes and roads," he wrote. Redwoods inside the park that had existed along the banks of the Van Duzen for 500 to 1,000 years had been lost during this time period from undercutting, he added. "Since geology, climate and other natural elements have remained roughly the same over this time period, it is obvious [that] the cause is poor timber harvest practices." That was before the habitat conservation plan, and one assumes that the timber harvest practices are better today. But there's no denying that, five years after Anderson's letter, logging in the fragile Van Duzen watershed is proceeding full steam ahead. What the consequences will be no one knows for sure, but the danger of extinctions -- such as to imperiled fish species -- is certainly there. As Pat Higgins, a fisheries biologist who has studied the Van Duzen, put it: "Either we start to recover [the watershed] or we'll start to lose options." 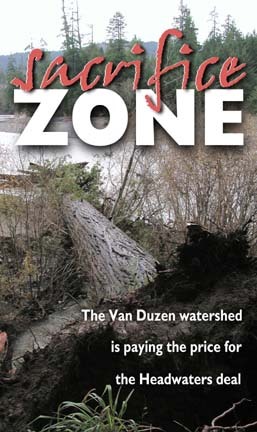 Friends of the Van Duzen River , a citizens' group, is holding "A Watershed Extravaganza" from 3:30 to 6 p.m. on Jan. 25, 2003 at the Monday Club on Main Street in Fortuna. Described as a "teach-in, eat-in and blues show," the event features speakers from an array of activist organizations as well as the California Department of Fish and Game. The general topic is, you guessed it, watersheds. In addition to music, there's a spaghetti feed. Price of admission is $10 for adults, $20 per couple and $25 to $30 per family. Call 768-3189 for more information. � Copyright 2003, North Coast Journal, Inc.